What is the High Tech Center for Students with Disabilities? 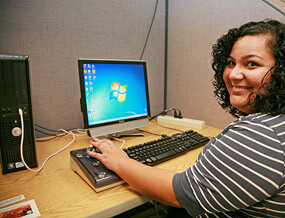 The High Tech Center is a standard and assistive computer technology lab where students with disabilities can work independently or with trained consultants. The lab features individual and accessible computer work stations in a work-friendly environment. At the High Tech Center for students with disabilities, we strive to create an encouraging, productive environment in which students with disabilities can learn and work. Our goal is to provide computer access to students with disabilities and assist in developing computer skills so that they are well-prepared for academic and professional endeavors. SDSU students who are registered with the Student Ability Success Center (SASC) and have a verified disability are eligible to use the High Tech Center. The High Tech Center provides access to assistive technology as well as standard software such as Microsoft Suite 2003 (Word, Excel, PowerPoint, Publisher, and Access) as well as internet access. 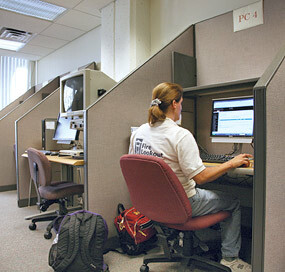 The High Tech Center provides access to various assistive software and hardware technologies for qualified students. See the full list of assistive technology resources. To receive one-on-one training and learn more about alternate media or assistive technology, please contact Severino Reyes, Coordinator of Alternate Media and Assistive Technology, at 619-594-0219.